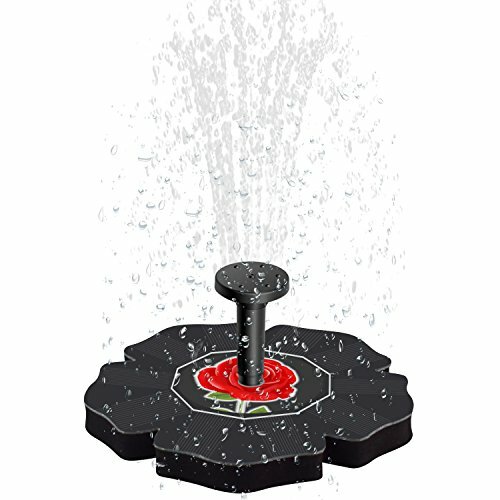 Flantor Solar Fountain Pump, Flower Shape Bird Bath Pump with Rose Picture 8 Modes Water Pump for Garden, Fish Tank, Pond, Bird Bath (Black) | Fountain City Art Ctr. 1.Leave it face to full sunlight. The pump does not store any power. Only when itfaces to full sunlight will the pump work. 2.Make sure the depth of water is enough to drive the pump. 3.Use clean and clear water to prevent the pump from stucking. 4.Press the pump under water totally for a while to let it work. 5.Clean the filter cover regularly for better working and longer life. - The Flantor Solar Power Pump presents a unique design in the market. With a rose picture in the middle of the solar panel makes it looks like a rose floating on water surface. A masterpiece to show your great taste. - Eco Friendly Fountain Pump: Driven by sunlight only. No battery or electricity needed. ( Do remember to let it FULLY expose to DIRECT sunlight or it won't work.) Safe to family with child and pet. No plugs required make it easy to move to different locations. - Multifunctional Designed Water Pump: With different sprayer heads enable you to DIY 8 kinds of spraying styles. (See picture 2 for guide) Ideal for bird bath, fish tank, pond, garden decoration, water circulation for oxygen. - How to use: Press the Bird Bath Fountain under CLEAR water for 3 seconds with its nozzle over water and make sure the solar panel face directly to the sun, no shadow. Clean it regularly to avoid it from stuck by dirt. Notice: Working power of the solar panel will be influenced by weather, location, etc. - 12 Months Warranty. If you have any problem with our product, please contact us and we will provide professional customer service. If you have any questions about this product by Flantor, contact us by completing and submitting the form below. If you are looking for a specif part number, please include it with your message.